The Octavia Fellin Public Library in Gallup, NM will be hosting its Annual Author’s Festival on April 8th from, 7 pm -8 pm and April 9th, 2016 from 10 am – 4pm. The festival will be in celebration of National Library Week. It will bring together authors from New Mexico and Arizona to present their works and have the opportunity to speak about their experiences. Authors will also be selling and signing their books. 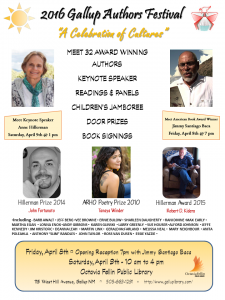 A special guest for this event will be Anne Hillerman. The current winner of the Tony Hillerman prize, John Fortunato will also be in attendance. Other authors for this event include Jimmy Santiago Baca, Martha Egan, Sharleen Daugherty, Jeff Berg, Rani Divine, Deanna Leah, Gerald McFarland, Max Early, Slim Randles and many more. The co-owner of LPD Press/Rio Grande Books Barbe Awalt, will be presenting a program as well as selling books. This event is free and open to the public. For more information, please contact the Octavia Fellin Public Library at 505-863-1291 or email at bmartin@gallupnm.gov.